When you have your first baby, it seems there is no end to the need for products and things. In fact, if you’re reading this now, your diaper bag is probably jam-packed with things you literally can’t live with out. Many of them may be loaded with toxic chemicals that can impact your newborn’s health, subtly priming them for disease later in life. New scientific research has proven that we’re not just the sum total of our DNA, but that what we do, how we live, and the environment by which we’re surrounded can profoundly influence our DNA. Dr. Rodney Dietert, author of PROTECTING YOUR CHILDS IMMUNE SYSTEM says that the first six years of life have an enormous impact on future wellness or disease. Babies in this country are born with over 200 chemical toxicants in their umbilical cord — meaning they’re exposed to toxins in utero and thus born with a measurable “body burden.” While chemicals are an integral part of our lives we can buy better in order to avoid them for babies and toddlers who are especially susceptible to the dangers of these toxicants. I know first-hand that it can be overwhelming to try and sift through all of your products – let alone your entire house – to try and determine what’s safe and nontoxic. I’ve spent several years researching products and have created this list for other parents who want to minimize, even eliminate, their babies’ body burden. The products on my list are all go-to items. Ones that are generally used daily, and often repeatedly, so it’s important for them to be nontoxic. Just a quick note for anyone feeling intimidated — everything you do in this regard makes a difference. Everything and anything. Now, let’s get started on your NoTox life journey. Wipes. Most wipes are wipes are filled with harsh chemicals and preservatives, some ingredients are hormone disruptors, potential carcinogens, and skin irritants. Even the so-called “green”, “eco” and “natural” wipes can contain not-so-nice ingredients. Some moms opt to make their own. Diapers.Unless you are using cloth diapers (don’t be too afraid, lots of people swear by them and you can hire a service to help with the washing, etc.) use the least toxic diapers you can find. I prefer 7th Generation or the Honest Company’s diapers because they’re both chlorine free, responsibly sourced and free of VOCs, scents, and petroleum derived lotions. While no 1-time use diaper is going to be perfect, these are better than most other diapers on the market and a majority of parents want a disposal option. Diaper cream. In the beginning, when you are changing so many diapers it feels like practically all you’re doing, you’ll need to have diaper cream handy. I like Medicine Mama’s multi-purpose healing balm (it’s really a cure-all for so, so many things! Use it on any scrape, bite, rash or dry patch). It’s particularly good for a sensitive bum and has no troubling chemicals, nanoparticles, endocrine disruptors, or fragrance to worry about! For a thicker, longer lasting coat try Waxelene, which goes on a little thicker. (Note waxelene has soy in it, while it’s organic soy, for some babies this may be problematic.) Another option is Weleda’s diaper cream which I recommend if you have a rash situation happening. Beware of Titanium Dioxide which could be nanoscale and should be avoided, especially for babies. Pacifier. If you’re going to use ’em, my preference is for it to be made from silicone. The thing about silicone is we know it doesn’t leach chemicals at regular temperatures but we’re not as confident at high temps. So just wash pacifiers in warm to hot soapy water but don’t boil it, to be safe. The other caveat about silicone is that it’s not biodegradable. Use it judiciously. Milk Bottles & Storage. Whether it’s breast milk that’s pumped or formula or some combination of the two you’ll want to make the investment in the newer tempered glass bottles to avoid hormone mimicking chemicals found in plastics. Life Factory makes a nice bottle that can transition to a sippy, which makes the price a bit easier to handle. But Medela and others are also making glass bottles that will work with your pumping system. If possible, store milk in glass in your freezer. If needed use plastic bags (I did) but don’t heat the bags in hot water. Let them thaw in the fridge and then transfer to glass before heating or warming. Baby/Kid Wash.Soap and body washes, even ones deemed hypo-allergenic, “natural” or “eco” can be loaded with chemicals, phthalates and skin and/or eye irritants. Use a nontoxic and simple soap with minimal ingredients. You should be able to pronounce everything in the ingredient list. We absorb as much as 80% of what goes on our skin so make your soap pure. I like Earth Mama, Angel Baby but this is made with Castille Soap as a base which is not a tear-free formula so I didn’t use it until my kids were old enough to know the routine of tipping their head back. I also like this one from Everyday Shea as it has a mild scent, good lather and decent price. The bottom line on baby wash (and creams) is avoiding scents, chemical foaming agents like Sodium Lauryl Sulfate, and ingredients you don’t know or can’t pronounce. Hand sanitizer. Of course you want to baby-proof your surroundings and make sure that your newborn isn’t exposed to germs unnecessarily. However, in our effort to wipe out all germs we have actually done our immune systems a disservice. Any item that says it’s “Anti-bacterial” or “anti-microbial” may contain triclosan or triclocarbon an endocrine disrupting chemical, which may lead to problems such as infertility later in life. (This rule applies to any product that says anti-bacterial or anti-microbial you’ll find it in toothpaste, mouthwash and even shoes.) Also, triclosan is a known and registered pesticide. It’s intended to kill things, not just germs but also the good bacteria we house too. Once on our skin, we absorb it and it can wind up taxing our organs. If all that wasn’t enough, these anti-bacterial/microbial chemicals can breed superbugs. Studies have shown that soap and water works equally as well without harsh chemicals.If you want a hand sanitizer to use on-the-go use an herbal kind like Clean Well or mix up your own, like I do using Essential Oils. (I like10 drops of DoTERRA’s OnGuard formula mixed with water in a spray bottle.) Of course you want to do everything in your power to protect your child, but in most cases, rabidly protecting your child from germs doesn’t do your babe any good. Coming in contact with all kinds of cooties actually makes your baby stronger and healthier in the long-run. Use natural materials. I suggest buying cotton and organic materials for bedding (ideally including the mattress), sleepwear and lovies. I can go on and on about this but the main point is to avoid all the pesticides and toxins that are found in synthetics and non-organic clothing. (Bedding can otherwise off-gas for years and in clothing it may take several washes for harmful chemicals to fully exit a fabric.) If you have a conventional mattress already consider an organic cotton topper (Naturepedic makes one). Buy organic jammies and onesies. For lovies, try for organic cotton as well like these by MiYim.Parents should use natural materials as well. Make sure that while you’re cutting out chemicals elsewhere you limit your use too. 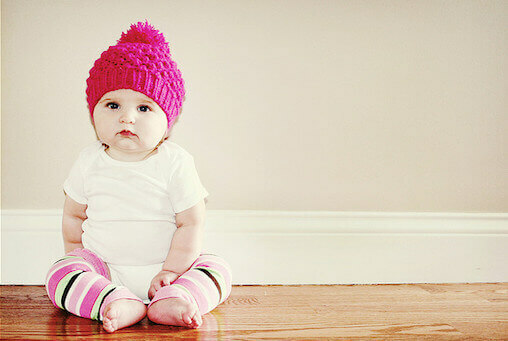 Your baby will spend a lot of time snuggled up to you so avoid wearing creams and fragrances. If you usually send clothes out to for dry cleaning switch to a green cleaner or another method as dry cleaning is one of the most common ways people pollute their homes. PERC, the main chemical in traditional dry-cleaning, is a suspected carcinogen and effects the nervous system. It takes weeks to fully off-gas and should instead be avoided, especially for kids. Laundry Detergent & House Cleaners.This one is sneaky and you can get duped into buying a hypo-allergenic “baby safe” detergent that costs more and contains toxins galore. (I fell for it early on, too.) According to EWG Dreft and other detergents aimed for babies get failing marks for containing reproductive hazards, possible carcinogens, as well as asthma and skin irritants. Skip those conventional products and opt instead for one without scents or dangerous chemical toxicants or engineered “synbio” ingredients. If you’re buying something with a scent make sure it’s derived from essential oils, but for babies, unscented is usually the best choice.The rule of thumb for all household cleaners should be to use the simplest formulations for day-to-day cleaning, ones that don’t contain “fragrance” or a long list of unpronounceable chemicals. A D-I-Y solution of water with lemon essential oil or water, vinegar, and lemon essential oil will clean most household surfaces incredibly well without any chemicals. For harder chores try Borax or baking soda with water. Those simple, inexpensive ingredients get me through the majority of my household cleaning. Fresh Air. This one is easy and everyone can do it. The EPA has said the indoor air pollution is a pressing national concern. The air in most of our homes is more toxic than the air outside. Hard to believe, but true. A quick fix for this is to open your windows everyday and let the outside air in. Try and get fresh air in for at least an hour a day and let it circulate through your home. Your entire family will benefit. To learn more ways to actively reduce your body burden sign up for my emails and class information at amyziff.com. Amy currently teaches classes on living a NoTox life, blogs about the chemical world we live in, curates Veritey Shop and is launching the first Nontoxic seal of approval. She is changing the world for the healthier one product at a time, one person at a time, one home at a time.